This unicorn hand puppet pattern is so cute and fun! 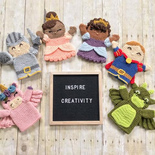 Great for creative play and story time. It could also be made in cotton yarns for a bath puppet! The size is made in one size, fitting children through adults, so that parents can play too! However, it can easily be adjusted by tightening your gauge or going down a hook size, if you’d like one to fit small children better. This pattern was designed by Erin Greene of ekayg, as a guest blogger for The Hook Nook Life Blog!